Coleraine manager Oran Kearney. Pic by Pacemaker. The expectation level for Coleraine will be raised further this year following a fantastic season last time out for Oran Kearney’s men. But the Bannsiders’ boss is determined it will not be a case of ‘after the Lord Mayor’s Show’ for his men this time out. The Irish Cup win in May, Coleraine’s first piece of major silverware in 15 years, sparked wild celebrations on the Ballycastle Road. Kearney though, who has been there and done it in local football, says a line has been drawn under last season. “Last season is done and dusted and it’s very much in the back of my mind and in the history books,” he said. “It’s about getting off to a great start on Saturday, getting three points in the bag and moving on from there. Coleraine host Warrenpoint Town in Saturday’s Danske Bank Premiership opener. Kearney is expecting a very tough game, especially as he is without no less than six players! “There are no easy games at this level and Warrenpoint will be out to impress and try to get off to a great start like every other team,” he said. “It is important that we are at our best and firing on all cylinders. “We are not a huge squad, but thankfully, bar the players who are suspended, we are largely injury-free. Kearney handed games to three promising young stars against Dergview in last Saturday’s final warm-up game. Full-back Ben Moore was handed a start, with Alexander Gawne and Jack Bradley also impressing coming from the bench. 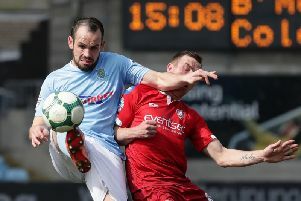 “The three lads, plus Andy Whiteside, have done really well and I wanted to get them more involved with pre-season but they couldn’t do any more training due to the SuperCupNI and we wouldn’t stand on their toes because of that,” said Kearney. “It gave us a chance to have a look at them and see how they’ve developed and I thought Alexander was great he came on and young Ben was assured at full-back. “It’s great for us and gives us a bit more depth, which is important. “It’s so important that we have players making the breakthrough and they are all local lads as well. One of those players who misses out is striker Jamie McGonigle, who was the subject of a bid from Crusaders last week. Kearney though is adamant his front man is going nowhere. “The bid being rejected is absolutely the stance that we have taken,” he said. “We are probably financially, across all areas of the club, in the best shape we have been in since I’ve been in charge. “We are not in a position where we are in dire straits and need the money, so it’s important that we can flex our muscles and show that we are serious about staying and competing at the top end of the table. “It was a very simple conversation that lasted all of about 10 seconds between myself and Colin McKendry. I think the reply was short and sweet as well and I hope that’s the end of it. Coleraine will have late checks on James McLauglin and Darren McCauley ahead of Saturday’s game. “James just had a twinge of the hamstring and it’s one of those at this stage of the season where the player comes straight off the pitch,” he said.